ALAMEDA, Calif. (NNS) — Crews from the U.S. Coast Guard, Customs and Border Protection Air and Marine Operations (AMO), the U.S. Navy’s coastal patrol ship USS Zephyr (PC 8) and the Colombian navy ship ARC “07 de Agosto” intercepted a low-profile go-fast vessel (LPGFV) and seized more than 1,000 pounds of cocaine in the Eastern Pacific Ocean, April 7. 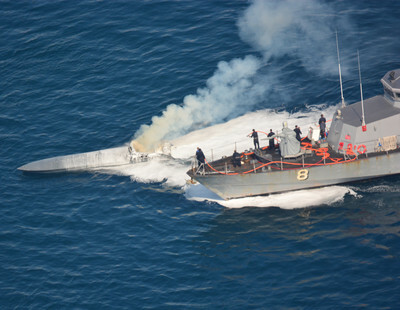 During a routine counter-narcotics patrol, an AMO P-3 aircraft detected an LPGFV, which is a custom made ocean-going, high-speed motor boat built by drug traffickers to smuggle large quantities of illegal drugs. The boats are primarily made of fiberglass and they travel barely above the surface making them difficult to see or detect by radar. The AMO P-3 crew reported the LPGFV to the Joint Interagency Task Force-South, which vectored the Zephyr to make the interdiction. As the Zephyr changed its course to intercept the vessel, the suspected smugglers allegedly began jettisoning their cargo and jumped into the water as their boat caught on fire. A Coast Guard law-enforcement team in an interceptor boat launched from the Zephyr interdicted the LPGFV, rescued four suspected smugglers and transferred them to the Zephyr. The Coast Guard and Zephyr crews extinguished the fire aboard the LPGFV after fighting it for approximately 90 minutes. “There was no doubt in our minds what needed to be done to salvage the evidence needed for a successful prosecution even if it meant laying Zephyr alongside a burning hull, with the intense heat and acrid smoke hindering our 90-minute firefight,” said Lt. Cmdr. Grant Greenwell, commanding officer of Zephyr. After the fire was extinguished, a Coast Guard law-enforcement team with members from both Maritime Safety and Security Team 91112 based in New Orleans, and the Pacific Tactical Law Enforcement Team based in San Diego, recovered approximately 1,080 pounds of suspected cocaine from the LPGFV. During the recovery, the “07 de Agosto” arrived on scene to work with the Coast Guard law enforcement team to document the case. This case marks the first drug interdiction for MSST New Orleans after becoming a pursuit-designated unit in July 2017. The LPGFV was severely damaged by the fire and was subsequently sunk as a hazard to navigation. In addition to Coast Guard crews, numerous U.S. agencies from the Departments of Homeland Security, Defense and Justice along with allied and international partner agencies, such as the Colombian navy, are involved in the effort to combat transnational criminal organizations. Counter-drug operations in the Eastern Pacific require unity of effort in all phases from detection, monitoring and interdictions, to prosecutions by the Department of Justice and partner nations. As part of its Western Hemisphere Strategy, the Coast Guard has increased its presence in the Eastern Pacific Ocean and Caribbean Basin, which are known drug-transit zones off of Central and South America. During at-sea interdictions in international waters, a suspect vessel is initially located and tracked by U.S. and allied, military or law enforcement personnel. The interdictions, including the actual boardings, are conducted by Coast Guard members. U.S. Naval Forces Southern Command and U.S. 4th Fleet support joint and combined military operations by employing maritime forces in cooperative maritime security operations to maintain access, enhance interoperability and build enduring partnerships in order to enhance regional security and promote peace, stability and prosperity in the Caribbean, Central and South American regions. Zephyr is homeported in Mayport, Florida. EDITOR’S NOTE: Information contained in this release was held pending review by the U.S. Attorney’s Office, Colombian Navy, U.S. Coast Guard, U.S. Customs and Border Protection and U.S. Navy investigators until a thorough review of the interdiction was conducted.